“A production of La Boheme in a pub theatre in English with a piano is closer to Puccini’s masterpiece than any starry concert performance could possibly be”, wrote veteran director Graham Vick recently in The Stage. And this new version, at Islington’s King’s Head, accompanied by piano plus cello, feels at least as authentic as many big opera house productions too. “Radically new” takes on Puccini’s 19th century tale of love, laughter and tragedy among impoverished Parisian artists have often been promised before, and this latest update by King’s Head artistic director Adam Spreadbury-Maher, relocated to contemporary East London, is not far removed from OperaUpClose’s version, seen at this venue just last year. But in paring down the cast even further – there is no space for fellow bohemians Colline and Schaunard, let alone hordes of revellers – the production becomes an intense focus on the two central couples. There is plenty of fun too – an important ingredient of the original – at least in the first half. The second works fine without light relief. Those on the front row risk starring as a surrogate Alcindoro with Musetta on their lap. 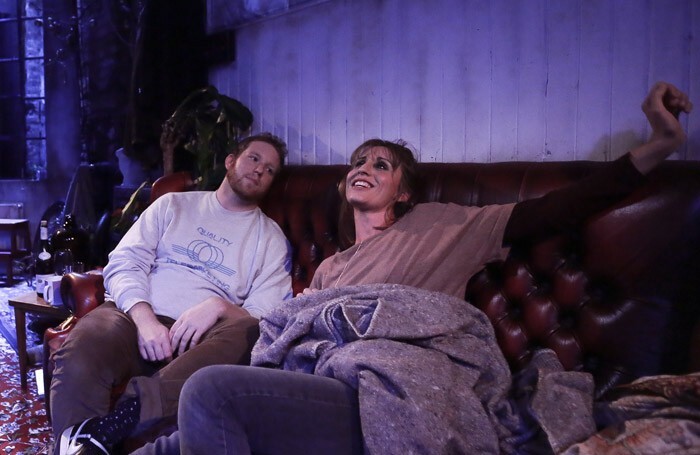 Success is due in large part to a slick new English libretto by Spreadbury-Maher and Becca Marriot (who also plays Mimi in the double-cast performances), convincingly colloquial if too self-consciously sweary. Their Mimi is a heroine addict – plausible and compelling, though it fundamentally changes the nature of Puccini’s tuberculosis victim. Stephanie Edward’s Mimi and Tom Isherwood’s Marcello (Mark) impressed vocally. They and Roberto Abate’s Rodolfo (Ralph) and Caroline Kennedy’s Musetta embody their roles with equal conviction.